Main stage: Alice In Chains, Stone Sour, Stone Temple Pilots, Bullet For My Valentine, Sevendust, and Tremonti. Side stage: Steel Panther, Pop Evil, The Sword, and Unlocking The Truth. Unlocking The Truth have premiered a new video for their song “Monster,” via Billboard. This track is from their new album, “Chaos,” which will be released on June 17. Unlocking The Truth have premiered a new video for their song “Take Control,” via Loudwire. This track is from their new album, “Chaos,” which will be released on June 17. Rob Zombie, Korn, Godsmack, Five Finger Death Punch, Papa Roach, Bring Me The Horizon, In This Moment, Atreyu, Hollywood Undead, Saint Asonia, Pop Evil, Nothing More, Butcher Babies, Art Of Dying, Glorious Sons, The Temperance Movement, Charm City Devils, Devour The Day, From Ashes To New, Unlocking The Truth and Dorothy. 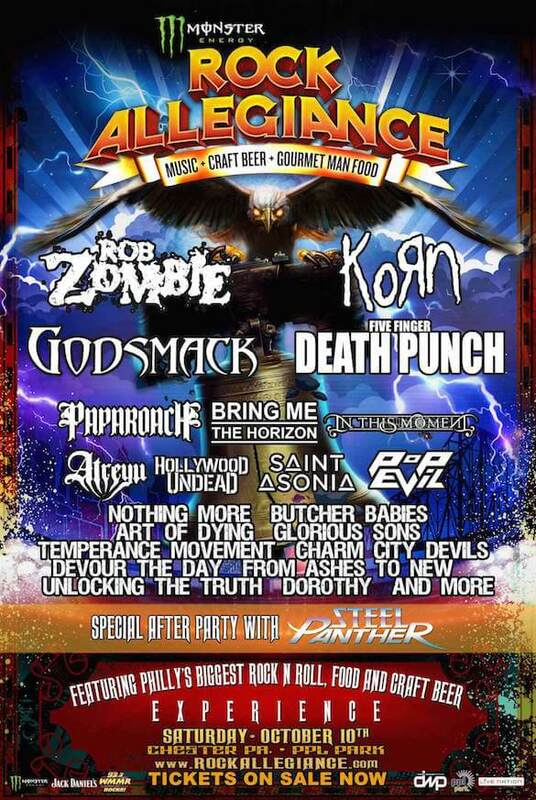 Steel Panther will also be performing at a special after party, once the festival concludes.